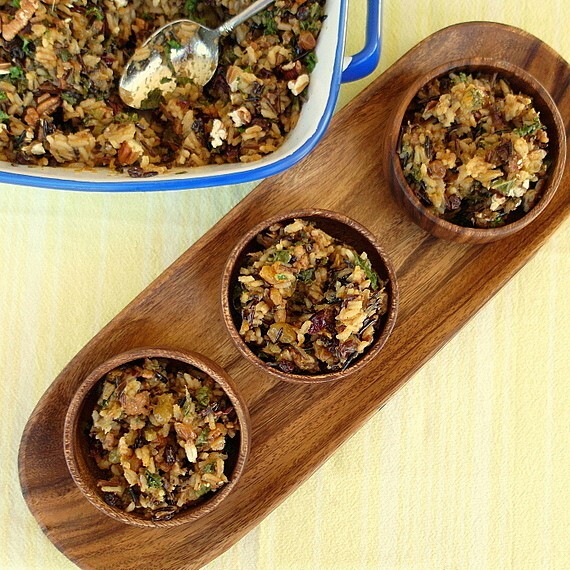 Gluten-free friends especially will enjoy this white and wild rice stuffing for Thanksgiving or any time! 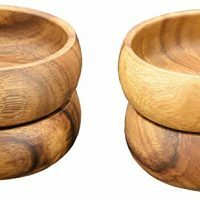 Pacific Merchants supplied me with the beautiful acacia wood pieces you see in the photos. Thanks, Pacific Merchants! 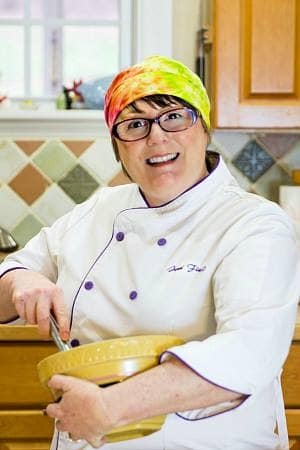 2 What Kinds of Fruit Can I Add to My Wild Rice Stuffing? 3 Do I Have to Make My Stuffing The Same Way You Did? I had every intention of making a yellow rice to show off the lovely pieces I received from Pacific Merchants. I could even see the photos in my head: brilliant, saffron-colored rice nestled against a white baker and cozy, warm, wooden bowls. Dotted with peas and cilantro. Because green equals healthy. Then I read a tweet or a facebook update, I don’t recall which, about a rice-based stuffing, and I immediately scrapped my old idea for this new one. 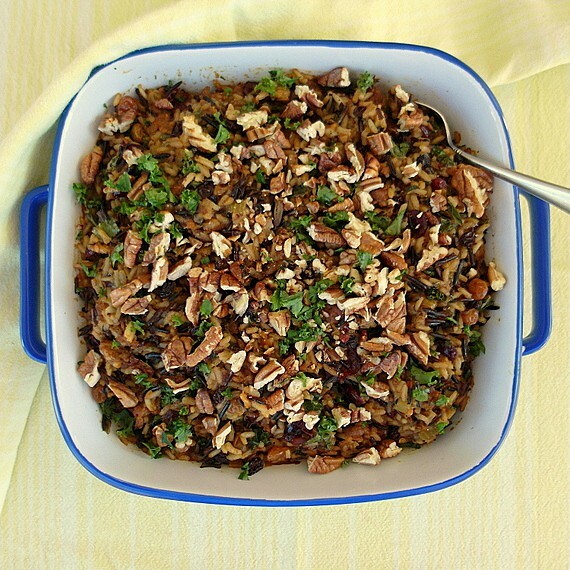 White and wild rice stuffing is particularly lovely topped with chopped pecans. I found a basic recipe for rice stuffing on allrecipes, and then I proceeded to stretch and change it so what I ended up with is a distant cousin of the original. Still, one has to start from somewhere, and I want to give credit to my inspiration recipe, Rice Stuffing with Apples, Herbs and Bacon. Add broth and wild rice and cook partially. Add the uncooked white rice and the rest of the ingredients. Cook until both rices are cooked through. Bake for a few minutes. 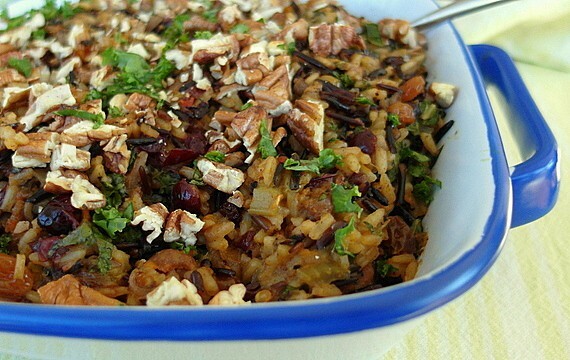 What Kinds of Fruit Can I Add to My Wild Rice Stuffing? 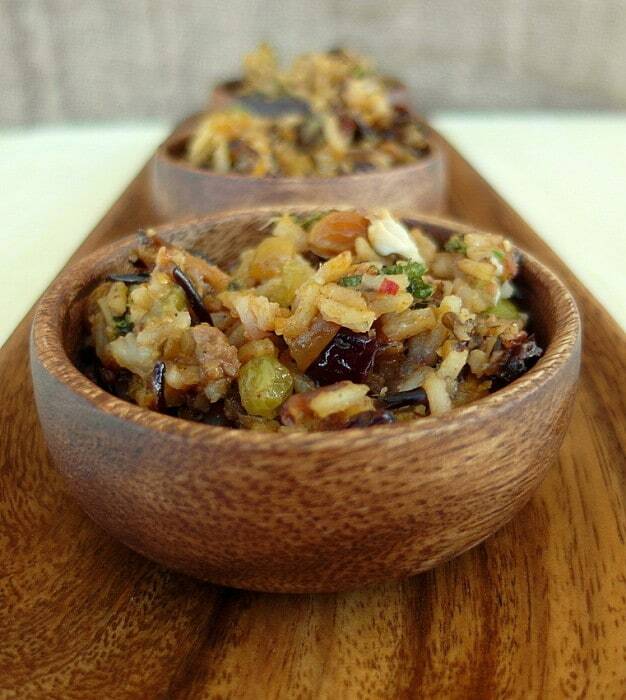 Pretty much any kinds of dried fruits you’d like would work nicely with the nutty wild rice. Every year for the past ten or so years, The Beloved has made Alton Brown’s Free Range Fruitcake to give as gifts to his friends at Christmas. It’s a fantastic cake, even if you aren’t a fan of fruitcake, and it’s full of various and sundry dried fruits. He has finished baking this year and has moved on to the Ripening Phase of fruit cake production which involves spraying down the cakes with brandy whenever he thinks of it, so I raided his fruit stash for my stuffing. Do I Have to Make My Stuffing The Same Way You Did? if you don’t like kale, leave it out. Or use chard or collards or even spinach instead. If you don’t like pecans, use other nuts such as almonds or walnuts, or leave them out. Don’t like the fruits I used? By all means, use your favorite. If you’re a vegetarian, use Gimme Lean instead of sausage (great flavor) and vegetable broth. 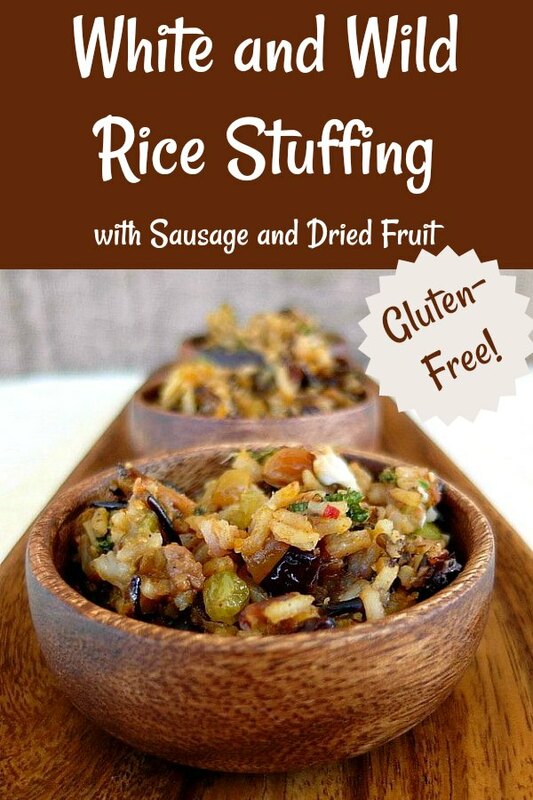 Any kind of stuffing recipe, including white and wild rice stuffing, welcomes variations, so play and enjoy! I can’t wait to hear about your variations. Let me know in the comments, friends! 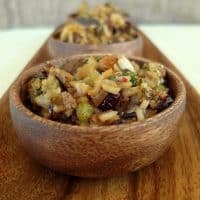 This sweet and savory white and wild rice stuffing is perfect for Thanksgiving or anytime you need a flavorful side dish. Feel free to add your favorite flavors. It's also gluten-free. Melt the butter/heat the oil in a large, heavy-bottomed saucepan until hot. Add the onion, carrot, celery and garlic along with a heavy pinch of salt and a few grindings of black pepper. Sweat over medium heat until translucent and soft, about 8 minutes or so. Add the marjoram and stir it around. Allow the vegetables to take on a bit of color and then add the vinegar. Cook until dry. Add the wild rice and 2 cups of the broth. Season with salt and pepper. Bring to a boil, stirring, and then cover and simmer for about 45 minutes until the rice has softened and is chewy. You're going to cook it more, so you just want to give it a head start. Once the wild rice is mostly chewy, stir in the white rice, sausage and dried fruits. (If the wild rice is still soupy, worry not. Mine was too.) Add the other 2 cups of broth and bring to a boil again. Cover and reduce to a simmer. Keep at a very low simmer for about 18 minutes, until the white rice is cooked. The mixture may still be just a bit wet. Fold in the chopped kale and spread in a casserole dish. Cover with foil and bake at 350F for ten minutes. This will cook the kale and help the rice to absorb any remaining broth. 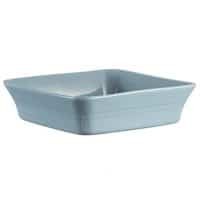 Remove from the oven and uncover. Sprinkle on the chopped nuts and a bit more finely chopped kale (optional). 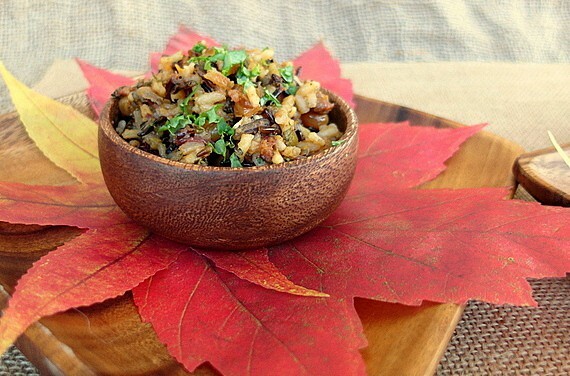 Nutty, sweet, and savory, you won’t miss the gluten in this rice-based stuffing! And there you have it. Thank you so much for spending some time with me today. Enjoy the gluten-free wild rice stuffing (or casserole, if you prefer), and enjoy browsing the Pacific Merchants website. So much great stuff to be had there!